January is the traditional time to follow through with good intentions and try for a healthier lifestyle. I am always full of New Year’s resolutions and sometimes I actually manage to pull them off. This year I have set myself a tough one, but as it doesn’t involve food or drink, I was happy to take on the teapigs #matchachallenge as well. I’ve had a love affair with matcha ever since CT brought some back from his Japan trip in 2007. I’d never heard of it before then, so it was a real novelty. Green tea was my tea of choice, so once I got used to the idea, it wasn’t such a big step to drinking matcha: it’s a very finely ground Japanese green tea with a distinctive flavour. Because you are ingesting the whole leaf this way, it provides a concentration of all those healthy nutrients that green tea is renowned for. It’s very high in antioxidants, has plenty of betacarotene and contains vitamins A, B and C. It’s said to boost energy levels for four to six hours after drinking it as well as raising metabolism and relieving stress. Teapigs matcha is organic and comes in 30g packs, normally costing £25. There is currently a 20% discount. As well as a great drink, matcha lends itself very nicely to baking, not only giving a distinctive flavour, but also an interesting green colour. I have made a number of cakes and biscuits using matcha, but was particularly pleased with matcha shortbread, matcha and white chocolate cupcakes and chocolate matcha battenberg. Much as I like matcha, it’s not something I’ve had every day, so I was interested to see if drinking it regularly made any difference to my flagging post flu energy levels. 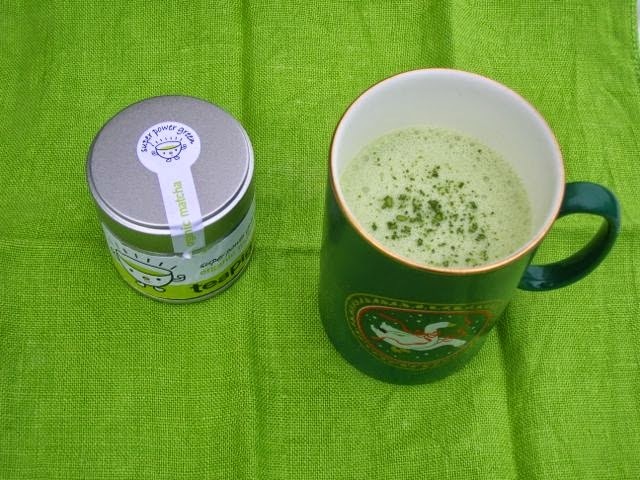 The teapigs #matchachallenge is to drink ½ tsp of matcha a day for a fortnight. It’s early days yet as I’m only on Day 5, but I have been enjoying finding different ways to drink it. I have so far made two different kefir matcha smoothies, drunk it as normal in a mug of hot water and tried it as a matcha shot in a glass provided by teapigs. Today I made a frothy matcha white hot chocolate. I used white chocolate so I could retain the beautiful green colour. Warmed 150ml of milk to just below boiling. Poured it into a mug containing 2 heaped tsps of white chocolate powder (I used Mortimer’s) and ¼ tsp matcha powder. Used an electric milk frother (kindly provided by teapigs) to mix and froth the drink. Sprinkled a little matcha powder over the top. It was delicious. The frothing gave it a really light texture and the white chocolate was creamy, but the matcha cut through the sweetness with strong refreshing notes. If you fancy entering the Matcha Challenge there is a chance to win a year’s supply of matcha from teapigs and a pack of matcha is being given away daily via instagram. The challenge runs throughout January and it’s a nice easy way to get your New Year off to a healthy start. Thanks to teapigs for providing a pack of matcha green tea, a shot glass and aerolatte frother in exchange for blogging about the challenge. I am sending the matcha hot chocolate off to Nayna for her event, Let’s Cook/Create Hot Drinks over at Simply Food. Well, this is going on my 2015 Bucket List; I will have to try this at some point, it looks so good! Haha, yes Stephanie, I guess drinking green coloured liquids might seem a bit unusual, but well worth a try. I’ve done the matcha challenge and I could definitely tell the difference, never thought to try having matcha in hot chocolate before, great idea. Hope you’re feeling better soon. Thank you Jen. So this is not the first year they’ve done the challenge then? No I think it’s been running for a couple of years, I had a go last spring and had seen it on other blogs before then. Ah, OK. Good to know you felt a difference. I’m on day 7 today. I’m with Stephanie. It doesn’t look too delicious but then again so do lots of foods that I love. I might try this and see what I think! It’s all in the mind Nora, I love the look of the green colour because I know what it is, but would probably hate it if I knew it was artificially coloured. I’ve never tried Matcha, and had no clue it was made from green tea of which I’m a big fan. Will definitely be trying it soon. Good luck with your challenge, keep us posted as to how you get on. Thanks Janice. I must say I’m feeling a lot more energised today. I am a tea drinker, but this is definitely not something I drink every day. It surely sounds very tasty! I’m drinking a cup right now Angie, but it’s made with only water this time. This looks like a Shrek hot chocolate 😀 Which is kind of awesome 🙂 I would love to try it! It’ll be interesting to see how you get on with the challenge matcha loaf is tasty too. Matcha loaf as in bread Laura? Lovely idea – I have tried Matcha but not in this way. Will have to give it a go – actually quite a healthy drink but still indulgent. Yum! I can’t quite remember if have had matcha or not, I think I need to have it again soon to remind myself one way or the other. The colour is great! It has a very distinctive taste Caroline, I’m sure you’d remember if you’d actually tried it. I like the sound of Matcha battenberg! It was a long time ago Sarah, but I remember it being exceptionally good. Happy New Year to you too Dom. Do use the matcha, it loses it’s colour and potency after a while. I’m not a fan of white chocolate but this does sound delicious with the matcha cutting through its sweetness. I actually think it looks very appealing – all green and frothy! I haven’t tried it with dark chocolate as a drink yet, mostly because I want to see the beautiful green colour, but I will do. I am a fan of matcha in a fruity drink – I need to test it in chocolate like you have. I’ve not really paired matcha and fruit – other than bananas and citrus, so that sounds interesting. Thank you. Hitting the stumble button on the side should work.